This night cream makes your skin smooth and soft and gives you a best result ever. 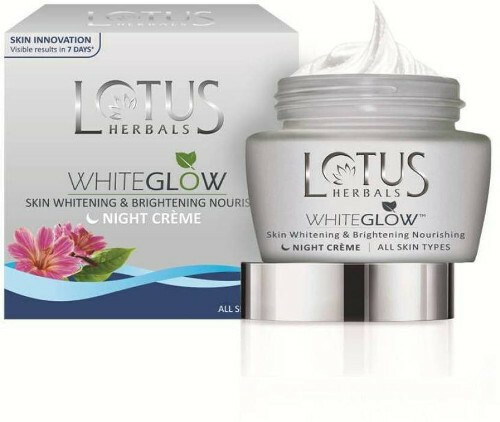 Lotus White Glow Skin Whitening & Brightening Nourishing Night Creme which has benefits of mulberry, grape, saxifraga extracts, and milk enzymes. Grape concentrate present in this night cream sheds the skin and permits it to infiltrate profound. Milk compounds square melanin pathways. Mulberry concentrate goes about as a decent tyrosinase inhibitor, counteracting hyper-pigmentation. Saxifraga concentrate searches free radicals that can bring about skin harm.The joined impact of these crucial fixings gives the skin a smooth surface, even tone, and whiteness, and puts a gleam all over when you get up in the morning. It can be utilized ideally for men and women.